Is your professional web presence scattered, outdated, non-existent? Then the Profile Theme is just what you’ve been looking for! It was designed to showcase everything awesome about you. Maybe that’s a little vain, but the internet is all about bragging rights. 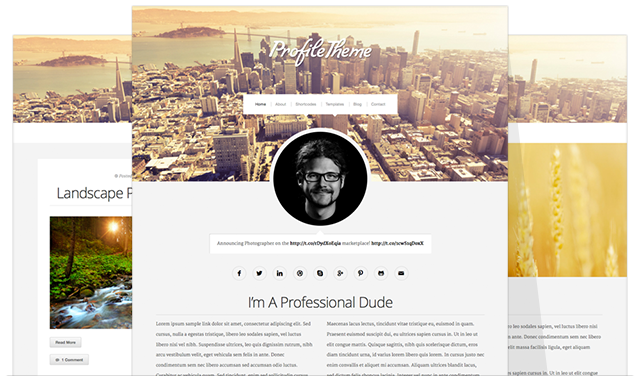 The Profile Theme is the perfect solution for an online resume, portfolio, personal site or just for impressing your friends. Our latest theme is a welcome addition to the collection. We like it so much, we’re even using it ourselves! I’m really enjoying the theme/design of your website. Do you ever run into any browser compatibility problems? A handful of my blog audience have complained about my site not operating correctly in Explorer but looks great in Safari. Do you have any ideas to help fix this problem? Support requests should be directed here: http://www.organicthemes.com/support. If you could let us know what version of IE and what issues, we can take a look. Please note, however, that we only support IE8+. why not updated my twitter feed? Only displays a blank space. I have a problem: I included the links to my social networks pages in “Appearance > Theme Options > Social settings” . Why the related link icons did not appear on my homepage? How can I get my profile picture onto my Homepage with my About page featured, but not have the profile picture show up on the actual About page when it’s opened? Like you have done on Live demo… The About page seems to be featured, but no profile picture comes up on the actual About page, only the Homepage. Any chance you could shed some light? I purchased the “Profile” premium theme through WordPress.com, then opted to switch to the self-hosted WordPress.org (using Bluehost). The transition team at Bluehost is trying desperately to get a zip file to make the new blog look EXACTLY like the old one or WP.com, but requires a .zip file for the theme. Is there any way to get this .zip file they need to create the new self-hosted blog (and have it look like the original WP.com blog)??? You will need to purchase the theme through us, for use with WordPress.org (http://www.organicthemes.com/theme/profile). If you purchased the WP.com version of the theme within 30 days, you can request a refund through them. I see that you are referring people to http://www.organicthemes.com/support, however, when I go to your site I do not have login info. and cannot find where to register for an account. Do I used my WordPress login and password? – I would like to have the header images different on every page. Currently, the Homepage header image is automatically populated to every page in the site, is there a way to change that? – I would also like to change the color of the Header Title and Tagline, is there way that can be done without having to go through the WordPress customization upgrade? That’s all and thank you kindly for any/all of your help! I have just emailed support on a couple of questions for this theme. Most Importantly how do I show the blog title and the picture like in the theme demo? Also, what is the font? I like it and would like to use it for some for my images that I will be putting in the sidebar. Please contact me. We will reply through support.